I've been making some Easter cards and thought I would share this one with ya. 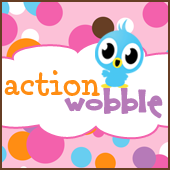 BTW< I am a follower,here and FB, already, and love your action wobbles! Sherri, your card is adorable! Love the cute bunny with the border of eggs! I forget that Easter is early this year so better get right on it! Thank you for your inspiration! What a cute bunny card! I love it very much! Wonderful creation and I especially like your color choices! Super Cute bunny!A sweet image!